Brief review of the 33rd Executive Committee Meeting held in Chennai, India, on 14 and 15 November 2017. 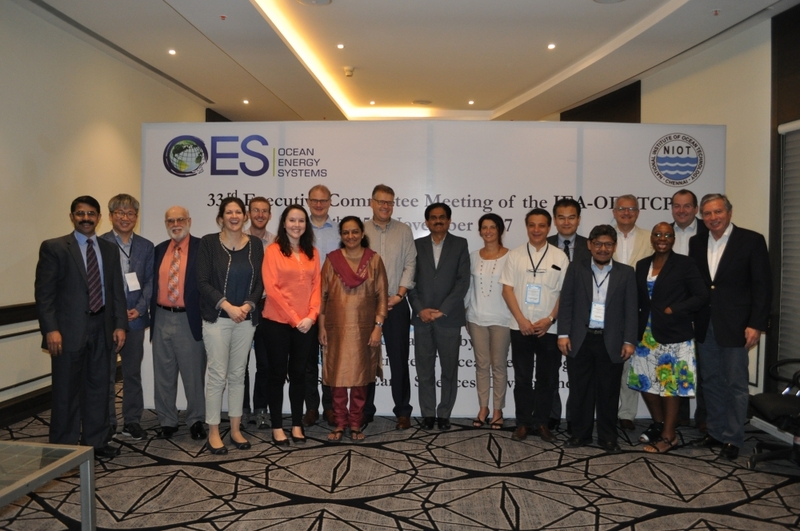 The Executive Committee (ExCo) of the Technology Collaboration Programme on Ocean Energy Systems (OES), within the International Energy Agency (IEA), announces the outcomes of its 33rd meeting, held in India, on 14 – 15 November 2017, with 14 representatives from the organisation member states. OES delegates participated in the inaugural session of the Indian wave powered navigational buoy and OTEC facility, during the workshop ’Harnessing Energy from the Oceans - A Global Scenario’ organised by NIOT, on the 13th November, with the presence of the State Secretary of the Ministry of Earth Sciences and the Director of NIOT. • Two new tasks are being initiated by the OES group: Stage Gate Metrics for Ocean Energy (Task 12) and Numerical Validation for Tidal Energy (Task 13). The Canadian Federal Government is investing CAD$1 million in tidal energy led by the Offshore Energy Research Association, which aims to address knowledge gaps and challenges associated with tidal energy in Canada. The Innovation Fund award for the project "Environmental Monitoring, Modelling and Forecasting Infrastructure for Instream Tidal Energy" was announced last month, with a budget of CAD$1.1 million from the Canadian Foundation for Innovations for state-of-the-art field equipment and high-end computing infrastructure. This is an Acadia University led multi-institutional tidal energy project with Dalhousie University, University of New Brunswick and Memorial University. The project is worth CAD$2.8 million in research funding, with matching funds from Nova Scotia, New Brunswick and equipment vendors. The Government of Nova Scotia announced in October 2017 that it will amend its Marine Renewable Energy Act to make it easier for tidal technology developers “to assess innovative, lower-cost tidal energy technologies” and bring their technologies to market faster. The changes to the Marine Renewable Energy Act will allow demonstration permits of up to 5 MW and allow companies to sell their electricity at a lower price than the existing tidal feed-in-tariffs (FiTs). Cape Sharp Tidal retrieved the OpenHydro’s open-center tidal turbine from the Minas Passage in June 1017. The turbine was installed at one of the testing berths at the Fundy Ocean Research Center (FORCE) in November 2016. The turbine is undergoing a detailed inspection and it will be re-deployed in the near future. In April 2017, the West Coast Wave Initiative, based at University of Victoria, released a co-authored report with the Pacific Institute for Climate Solutions - “Wave Energy: A Primer for British Columbia”- summarizing key research findings about the magnitude of British Columbia’s wave energy potential and the challenges and opportunities of the sector. Tribute Resources acquired 100% control of the Dutch tidal device developer, Tocardo, after having acquired a 46.5% stake in July 2016. The short-term objective for the company will be a first deployment of Tocardo’s semi-submersible Universal Foundation System equipped with five turbines, in the Bay of Fundy in late 2018. The European Commission (EC) has supported a study on Lessons for Ocean Energy Development, which was published last June. This study has reviewed failures, lessons learnt and good practices in wave and tidal technology and concludes with recommendations for a more integrated approach, identifying the best pathway for ocean energy technology development. A new market study on Ocean Energy also funded by the EC is now in preparation to estimate the financial needs of the ocean energy sector in Europe. The European Commission has launched a call for proposals on environmental monitoring of tidal and wave energy devices. This call aims to support an implement some of the recommendations of the Ocean Energy Strategic Roadmap regarding planning and consenting procedures, and addressing gaps in knowledge on potential impacts of future deployments. The deadline to submit applications is 19 January 2018. Also, last October the European Commission launched the Work Programme 2018-2020 of Horizon 2020, the EU's Research and Innovation funding programme. “Horizon 2020 is the largest multinational programme dedicated to research & innovation and it is open to the world.” This means that researchers throughout the world can participate in Horizon 2020 projects - though they are not always eligible for H2020 funding. The Ocean Energy Temporary Working Group is looking on how to reach the cost targets for wave and tidal energy (10 ct/kWh in 2035) and working together with Member States/region representatives, research and industry to define actions for the coming years. In France, the 10-year targets for installed capacity and consented projects will soon be updated in the governmental “Pluri-annual Energy Policy”. A new law is being discussed to favour renewable energies by simplifying their deployment. Two situations are being debated: i) to have the cost of the export cable supported by the French Transmission System Operator, for all offshore developments; ii) to simplify the consenting process by issuing a framework permit for the site before the call for tenders. The French government is also supporting continued research and development in marine renewable energies through financing operated by the National Research Agency (ANR) and supporting collaborative projects conducted by France Energies Marines: an additional €3 million of matching funds have been awarded to collaborative projects in 2017. Ifremer, ECN and Oceanides are involved in the MaRINET2 project, offering possibilities to technology developers to test their devices in recognized research facilities, including real sea test conditions. Under MaRINET2, calls are open to give developers the chance to access testing facilities in Europe free of charge. In the first call this year, a total of 48 proposals were received from 21 countries. Support of €1.3 million has been awarded to 34 projects for free of charge access to testing facilities. The second call for proposals will open on the 15th of January, 2018. France has several test centres fully equipped and grid connected, where projects are about to be tested: Floatgen, a nearly assembled offshore wind turbine, had its mooring be installed this summer at SEM-REV on the west coast, offshore Le Croisic, ahead of the actual shore connexion. In addition, 3 wave energy demonstrators are planned to be tested next year. At SENNEOH, a tidal test site in the Gironde Estuary in the city of Bordeaux, the first tests of the ¼-scale HydroQuest marine turbine will be hosted. Future plans include testing their technology at full scale next year at Paimpol Bréhat, a tidal test site operated by EDF in North Brittany. BREST Saint-Anne is a new test site for scaled projects where GEPS Techno recently tested a multi-use platform and where EOLINK plans to test a 1/10-scale floating wind turbine in 2018. The ICE (Intelligent Community Energy) project (2017 – 2020) is dedicated to developing and implementing intelligent energy solutions for isolated communities. Sabella tidal turbine was one of the solutions tested under this project connected to the isolated grid on the island of Ouessant (Ushant), offshore Brest. The French developer is now planning its first Asian tidal project in San Bernardino Strait, off Capul Island in the Philippines, with a local project developer, H&WB, and PNOC RC, the renewable branch of the Philippine National Oil Company. This project will be a showcase energy solution tailored for isolated communities. The beginning of procurement is planned for 2019. Under the Copernicus programme, a free worldwide service for Tidal Energy Assessment – TidEA – has been released: http://www.tidea.io/tidal_energy/. It is a web interface offering the identification of sites anywhere in the world appropriate for the development of tidal energy projects. The German company SCHOTTEL HYDRO continues to expand its projects pipeline: At FORCE, Bay of Fundy (Canada), the installation of its semi-submersible platform carrying 40 SIT turbines (2.5 MW total) is now planned to happen next year. Also, in partnership with Minesto, SCHOTTEL HYDRO has developed a 500 kW turbine solution for the DEEP GREEN project: turbine and power conversion system have been fully assembled and factory acceptance testing is currently underway. A single SIT turbine mounted on a catamaran platform is also being tested on Sentosa Island, Singapore, in collaboration with Nanyang Technological University's Energy Research Institute, OceanPixel and Aquatera. Four turbines (268 kW in total), to be installed in Sustainable Marine Energy’s PLAT-I trimaran platform, are under construction with first deployment being prepared at Connel Sound, Scotland, and a later deployment planned in Singapore. Three SIT turbines (190 kW in total) will also be installed in the tidal turbine platform prototype named “Kraken”, developed by QED Naval, expected to be tested next year at EMEC. Furthermore, SCHOTTEL HYDRO has delivered a turbine to the Massachusetts Maritime Academy for installation in the Cape Cod Canal. The German wave energy developer NEMOS concluded this year a 3-year research project “Design, Manufacturing, Installation and Commissioning of NEMOS Wave Power Plant Model at 1:1 Scale”, funded by the German Federal Ministry for Economic Affairs and Energy. A prototype is being constructed at a Belgian shipyard since February; in June the company got the permits for its installation in the North Sea near the Port of Ostend. Sinn Power is another German developer planning to deploy four additional WEC modules at their test site at the Port of Heraklion next year, and to erect a full wave energy farm at the Fazenda de Camarão organic shrimp farm on the island of São Vicente, Cape Verde. Last month, REAC Energy GmbH completed sea trials on Orkney Islands, with their vertical-axis turbine known as “StreamCube”. An innovative pumped storage system was tested at 1:10 scale in the Lake Constance from November 2016 until March 2017. The technology has been developed within the StEnSea project (Stored Energy in the Sea) which has been funded by the Federal Ministry for Economic Affairs and Energy. A follow up project proposing to install a 1:3 device at an offshore testing facility at around 600 meters water depth is currently under consideration. The first wave powered navigational buoy, developed at the National Institute of Ocean Technology (NIOT) in Chennai, India, was launched on the 13th November 2017 on a special session during the workshop ’Harnessing Energy from the Oceans - A Global Scenario’. This event happened on the eve of the 33rd OES Executive Committee meeting held in Chennai, hosted by the National Institute of Ocean technology (NIOT), an autonomous institute under the Ministry of Earth Sciences. Designed and built by NIOT, the navigational buoy has been successfully tested offshore the Ennore port, on the Southeast coast, since its deployment on the 8th of October, this year. There are several ports in India interested in this technology to power oceanography buoys. Under the New Priority Programme (2017-2020), the Government is funding the development of an OTEC powered desalination plant of 100m3/day capacity at Kavaratti, a small island on Lakshadweep archipelago, on the south western coast of India. The detailed bathymetric and geotechnical surveys are now completed, the preliminary layout of the plant has been done and the consenting process is almost concluded. OTEC is one of the focal research areas in NIOT. In the last decade several small scale OTEC desalination plants have been built in Lakshadweep. Ireland’s Offshore Renewable Energy Development Plan (OREDP) is the existing framework for the sustainable development of offshore marine resources. A mid-term review of the OREDP has been done, involving public consultation. There are opportunities to up 6 GW capacity (wave and offshore wind). Legislation that underpins the licencing process needs an update as it is in place since 1993. Sustainable Energy Authority of Ireland is further looking to develop a pre-commercial fund mechanism. The IHI group has been developing a floating ocean current technology, under a contract with NEDO (New Energy and Industrial Technology Development Organization), to use the stable ocean currents, such as the Kuroshio Current, along the coast of Japan. Kuroshio Current is one of the largest ocean current in the world. A new test site at Kagoshima Prefecture has been approved for ocean current projects. In this site, IHI has tested their 1:3.5 scale floating ocean current demonstration project called "Kairyu" (100 kW), over the summer. There are plans for continuation and a 1 MW x 2 = 2 MW floating device has been designed to be deployed at 200 – 1000 meters water depth (50 meters below the water surface). Japan is organising The Grand Renewable Energy 2018 International Conference and Exhibition, which will be held in 17 – 22 June 2018, at Pacifico Yokohama. CEMIE-Océano, the Mexican Centre for Innovation in Ocean Energy has been very active over this year,investing on capacity building and fostering international collaboration, knowledge transfer and interchange of researchers. Several workshops have been organised and three important publications in Spanish language have been released: i) State-of-the-Art of Conversion of Ocean Thermal Energy (OTEC); ii) State-of-the-Art of Salinity Gradient and iii) Interconnection to the Grid and Energy Storage Systems. Two natural laboratories have been established, at Ensenada and at Cozumel Channel, as research test sites. National resources assessments have been done, in particular to characterise tidal currents on the passage connecting the Caribbean Sea and the Gulf of Mexico, known as the Yucatan Channel, and also at Gulf of California. Salinity gradient is also a key research topic in Mexico, and some exploratory field campaigns have recently been undertaken. The New Zealand Government has a target of 90 % of electricity generation to be from renewable sources by 2025. New Zealand has abundance of renewable resources for electricity generation, and marine energy is one of these resources. New Zealand has the fourthlargest exclusive economic zone. The Aotearoa Wave and Tidal Energy Association, created in 2006, has been promoting the development of a marine energy industry in New Zealand. A number of wave and tidal power devices have been proposed but only one, Wave Energy Technology – New Zealand (WET-NZ AzuraWave), has been developed in New Zealand and moved to the open sea test site in Hawaii. The Sustainable Seas National Science Challenge aims to help enhance the value of New Zealand's marine resources, while providing a healthy marine environment for future generations. Sustainable Seas brings together teams from across a range of science and community organisations. The Sustainable Seas Challenge is working with all stakeholders, researchers and policy experts to collectively improve the management of competing uses of the marine environment. To do this, the Challenge has set up research themes, each dealing with a key socio-scientific issue affecting New Zealand. The Blue Fund is a financial mechanism recently established by the Portuguese Government this year. Tenders were launched in September this year to award funds to projects from "new entrepreneurs of the sea" and for promotion of ocean renewable energies. A specific call to fund research and demonstration prototypes for wave energy production systems and/or components has been seen as an opportunity for private companies and research organisations to establish consortiums and develop joint projects. The maximum grant per application was €200,000, financing up to 90 % of the total eligible expenditure the project. AW-Energy has now concluded the licensing stage for the first commercial 350 kW device (FOAK project) to be installed in Peniche, the site the company has been using for their continuous developments in Portugal. The manufacturing of the device is ongoing and the commissioning is expected for the first half of 2018. Further, the company has already started the licensing process for the pre-commercial 5,6MW farm (SWELL project). During this year, the UK-based tidal energy developer Oceanflow Energy has been testing a small-scale tidal current turbine known as Evopod E1, in a shallow-water estuarine environment, in Algarve. This deployment has been done in collaboration with the University of Algarve, as part of a national funded project SCORE. Within the European funded project OPERA led by Tecnalia, IST (Instituto Superior Técnico) and the private company Kymaner have been developing a bi-radial turbine, which was installed and tested at the OWC Mutriku breakwater, in May. It is also planned to be installed at the Spanish ¼ scale OCEANTEC sparbuoy-OWC and tested at Bimep. Further, within the European funded project WETFEET coordinated by WavEC, IST has been developing a twin-rotor air turbine for wave energy converters. The Ministry of Oceans and Fisheries (MOF) is supporting the development of two open sea test sites, for wave and tidal energy. The wave energy test site is located on Jeju Island and will have 5 berths; the design of the underwater cables and substation is now complete, and the consenting procedure is underway. The tidal energy test site will have two berths, one for small scale tidal turbines to be located at the Uldolmok Strait and the second berth for large scale turbines at the Jangjook Channel. These tests sites are being developed with a budget of USD$17 million for the wave test site, and USD$24 million for the tidal one. The Korean Institute of Ocean Science and Technology (KIOST) has been leading a project to develop a horizontal-axis tidal turbine with 200kW rated capacity. The supporting structure is ready now and the rotor-nacelle is planned to be installed until end of this year. The Korean Research Institute of Ships & Ocean Engineering (KRISO) continues to develop the Floating Pendulum wave energy converter with 300 kW capacity: It is now fabricated and waiting for the open sea tests next summer, at the test facility on Jeju Island. KRISO has also been progressing with the development of a breakwater-connected OWC-type wave energy converter for application on remote islands. Singapore has particular interest on ocean energy to power remote islands and coastal communities, and the Energy Research Institute at Nanyang Technological University (ERI@N) is focusing on wind and tidal energy integration projects to Smart Grids on remote regions. Several tidal turbine systems have been deployed and tested over the last 2 years. Singapore has now the world’s largest floating photovoltaic (PV) test bed at Tengeh Reservoir. This project is a collaborative initiative spearheaded by Singapore Economic Development Board (EDB) and PUB, Singapore’s National Water Agency, and managed by the Solar Energy Research Institute of Singapore (SERIS). The project team will be conducting a rigorous two-phase study of the economic and technological feasibility of deploying large scale floating PV systems on inland water bodies. The Renewable Energy Integration Demonstrator-Singapore (REIDS), an R&D initiative led by Nanyang Technological University (NTU), is partnering with multiple industrial partners from different sectors. Their focus is in wind, solar and tidal energy systems to hybrid micro grids. NTU is developing a tropical marine energy floating laboratory in Singapore, in collaboration with key partners from other countries. A feasibility study for tidal energy test sites has been done with support from an industry partner, ClassNK. Wave Energy Scotland (WES) has been supporting contracts for the development of innovative technologies, aiming to produce low cost, efficient and reliable components and subsystems for wave energy. In 2017, a call was issued on control systems for wave energy converters and now bids are open for 4 new short projects– landscape studies – to help inform any future WES project calls focussing on cost reduction in supporting infrastructure. The first two contracts focus on optimum choices for electrical connection solutions and foundations and moorings; the remaining two contracts will involve ‘horizon scanning’ to understand opportunities in very large-scale wave energy converters and alternative generation techniques. A total budget up to £320k is available for these 4 projects. Up to now, 175 companies have been involved in the WEC programme and 61 projects have been funded to date; £25.3 million is the budget spent or committed on programmes to date. Wave Energy Scotland has launched a Knowledge Library, a single database for the sector, providing access to key information and documents generated from its wave energy research and development programme. The UK Centre for Marine Energy Research (UKCMER), in association with Wave Energy Scotland, has opened this year a call for proposals for research projects in wave and tidal energy, addressing several topics, such as numerical and physical modelling, control methods, development of design and analysis tools, new materials and processes and disruptive technologies. A budget of £500,000 was allocated for this call. The United States of America have a very active industry on ocean energy with over 70 developers currently active. Most public funding for marine energy development in the U.S. comes from the Department of Energy (DOE): over USD$325 million has been appropriated for marine energy projects since 2008. The level of funding has been growing: the programme started with USD$10 million in 2008 and has grown to almost USD$60 million in 2017. DOE focus is on developing a pipeline of marine energy projects, from component and system design to tank and open sea testing. Support has been granted through national laboratory and academic research at the earliest stages, as well as to individual companies. Most developers in the U.S. are on the early part of the pipeline, but an increasing number is starting tests at substantial scale in open water. · Small Business Voucher (SBV) and CRADAs: provide clean energy small businesses access to select national labs facilities & expertise. The U.S. Navy has also a long-standing marine energy R&D programme, and it is operating a wave energy test site in Hawaii. There is a wide range of test facilities in the U.S. for wave and tidal testing, both in water and laboratory. DOE has just finalized an agreement with a group led by Oregon State University to build the largest open water test site in the U.S., in the highly energetic waters offshore Oregon. It will be a four berth site with total capacity of 20 MW. One recent push by DOE is to work with industry to identify non-utility sectors as possible end users or applications. There are many different possibilities that range from just scaled down consumer power generation to fundamentally different industries like desalination, seawater mining, as well as micro power for ocean observation or underwater vehicle charging. An analysis of these markets for marine energy has been done and it is expected to be published early next year. DOE will run a workshop in 5-7 December 2017, in Washington D.C., with market representatives and marine energy developers. The data from DOE’s Wave Energy Prize was released on the Marine and Hydrokinetic Data Repository (MHKDR) on November 16, 2017.